Have you ever dreamed of moving to Paris? Or at least dreamed of a “pied à terre”, as the French call a second home? Just a tiny little apartment under the roofs of Paris with a view on the Eiffel Tower? Something modest, adequate, but still romantic? Well, I’m sorry to tell you that it probably won’t happen. Real estate prices in Paris are sky-rocketing like never before. Yesterday, the Paris Chamber of Civil Law Notaries published their statistics. Today the headlines of the French newspapers sound alarming: “Real estate prices in Paris beat all records”, reports Le Parisien. And Libération headlines: “The summit of insanity”. Sounds exaggerated? Sadly, it isn’t. At no point in history have the prices of real estate in Paris been higher. For the first time the average price per square meter has risen above the mark of 7000 Euros (9300 US$). The new figures mark an increase of 13.8% in the last twelve months. Du jamais vu! as the French say, never seen before! In central Paris and the neighbourhoods en vogue the situation is even worse: prices have climbed here well above the 7000 Euros-mark per square meter. Try to find, say, a small home on Ile-Saint-Louis or in the Upper Marais or in the posh 7th Arrondissement for this price. It’s impossible. You’ve got to pay much more. In the most expensive neighbourhoods, the 4th and the 6th arrondissement, Marais and Saint-Germain, a 10-square-meter studio easily costs 100 000 Euros. Square meter prices of 12 000, 13 000 Euros have already been reported. Some people say the prices will continue to rise, others warn about a bubble. Remember? Before the financial crash of 2008 it was the Americans who believed in eternally rising real-estate-prices… Yet there’s reasons for the ongoing Paris boom and the year-to-year price explosions: Paris is not, like London or New York, a big, spread out city. There are hardly any apartments for rent (and if you find one, you won’t get hold of them because the waiting list is miles long). Interest on bank loans is low which makes it attractive to invest. Plus: a lot of investors nowadays flee the unpredictable stock market – and invest in “bricks and mortar”. With climbing prices other types of investors arrive. More and more foreigners are buying real estate in Paris. Overall, they made up 8% of the sales, yet in some neighbourhoods like Saint-Germain-des-Prés foreigners were involved in 22% of all deals. But these are not people like you and me. For some of them spending up to 20 000 Euros per square meter for a very nice appartment is no big deal, imagine. The truth is, Paris is going to become a museum. Gentrification is not an exception but the general phenomenon. The minute that somebody with an extremely edgy hairdo arrives in a neighbourhood, prices start to climb – putting pressure on small food shops, craftsmen, old-fashioned boutiques. The next thing you’ll see is exotic restaurants, art galleries and designer shops displaying fashion for kids and baby rompers in cashmere for 320 Euros a piece. After a while, the buzz moves on again. In Paris, to the 19th arrondissement. To the 3rd. To the 15th one day, who knows. 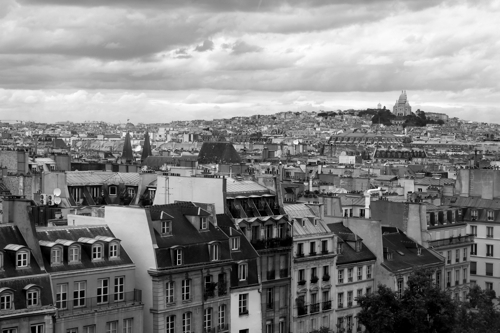 A lot of Parisians are in fact forced to move out. They just can’t afford housing anymore. Butchers are closing, bakers are selling their shops to fashion and fast-food-labels. And where you bought your baguette yesterday, you’ll by the It-bag tomorrow. A sad thing? Well, yes. Was it different before? Not really. Still, the vision of a Paris without Parisians doesn’t hold much appeal.